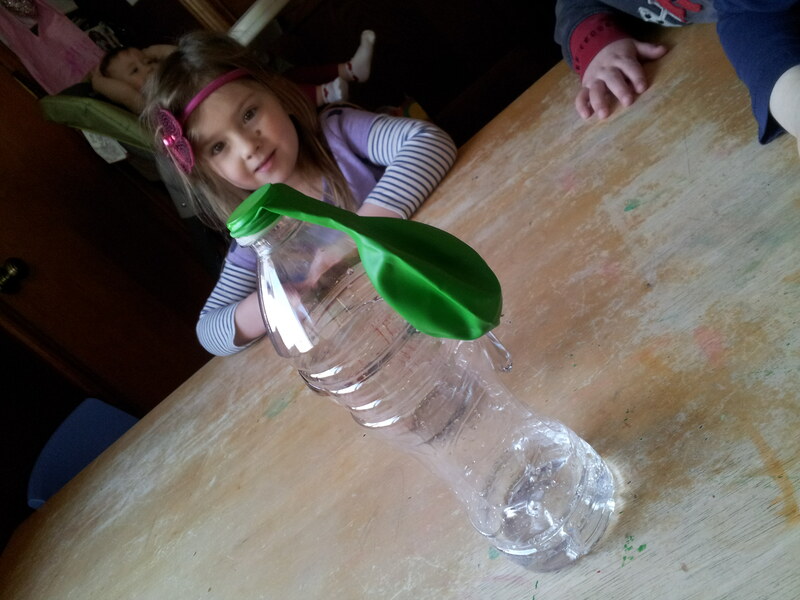 The kiddos are always so enthusiastic about any type of project but today when I set out an empty water bottle, “special” water (vinegar and water mixed), and a balloon that was filled with baking soda they were extra excited! I think it was because they seen the balloon….any activity that involves a balloon is a good one in the eyes of a child. 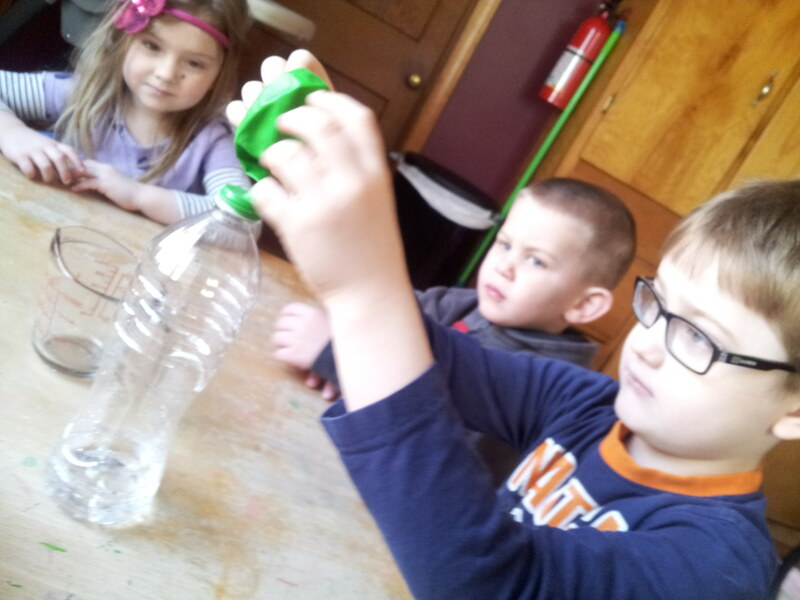 I explained that we were going to do a science experiment and I needed their help. First we sat down and looked at the materials. Our next step was to guess what they thought we were going to do. One said we were going to pour the water into the balloon and have a water balloon fight. 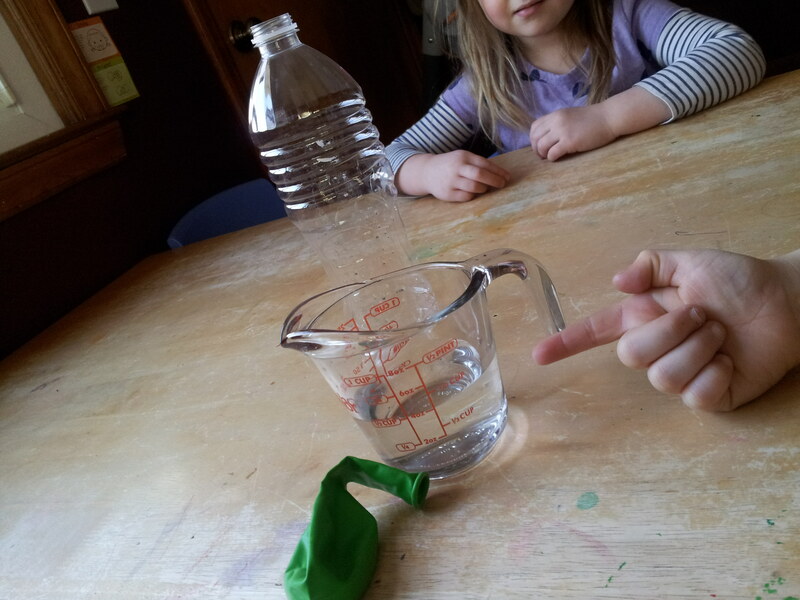 Another child said we were going to dip the balloon in the water and then drink the vinegar 😉 I explained that we were going to fill the bottle with the water/vinegar mixture and that I put baking soda in the balloon. I then told them I was going to stretch the balloon neck onto the bottle. 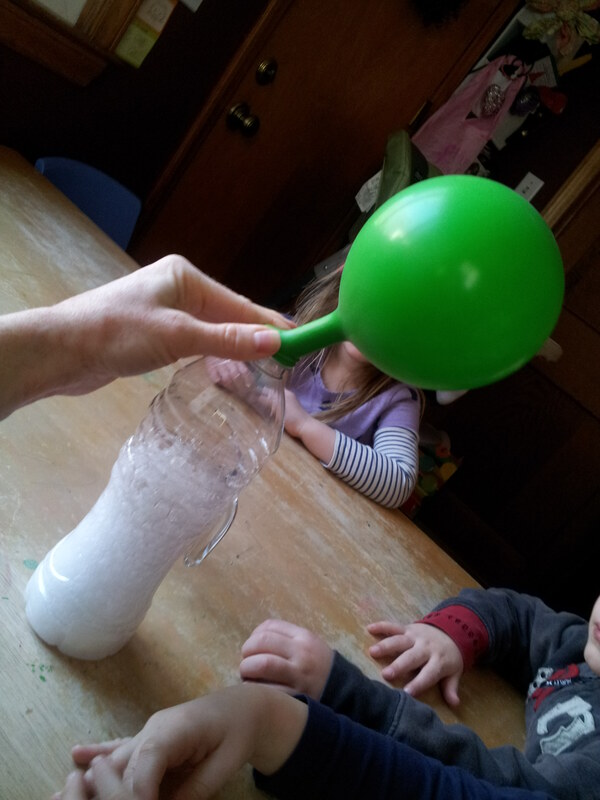 This is where I asked them what they thought was going to happen when the baking soda dropped from the balloon into our “special water”. They all agreed it was going to “blow up”. 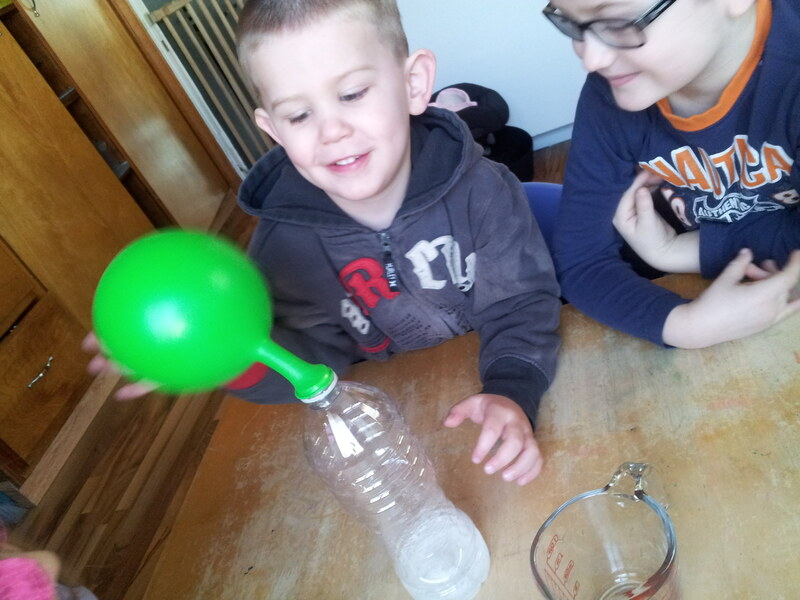 While the purpose of this experiment was to blow up the balloon I have doubts that they were referring to that 🙂 The kids shook the balloon and watched the “magic” happen. There’s nothing like watching the kiddos light up when they see something exciting or new! Today we had yet another cold snowy morning in Mi, but the kiddos and I decided to turn our snow day into a BEACH DAY! 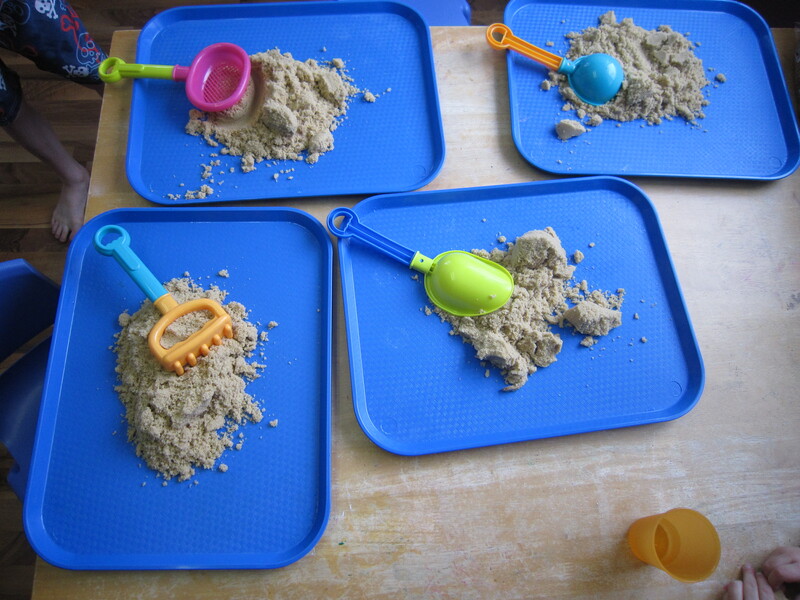 The kiddos changed into their suits and sunglasses and we played in the “sand” (brown sugar), had water play, made a pretend beach, laid in the “sun”, blew bubbles and played with beach balls. Oh and had a picnic lunch on our beach 🙂 What a fun way to spend this cold winter day.